July is the most intense month for any comic fan.That’s mainly because of San Diego Comic Con. This makes it double busy for us as we try to run a website, edit videos and do interviews. So for this Did You Catch All That we decided to give you our very best interviews from San Diego this year. 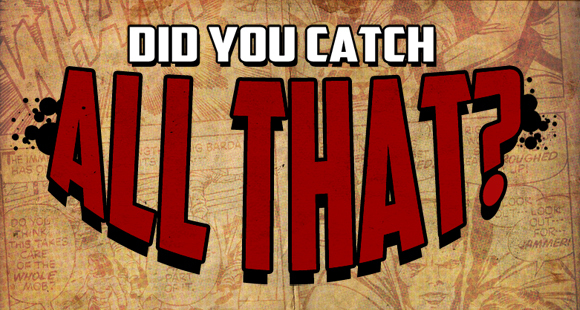 So sit back and get ready for an action packed, interview filled episode of Did You Catch All That? Join us as Simon talks to Erik Larsen about the future of Savage Dragon,Sheldon talks to DC collectibles and he finds out how tall Darkseid really is.Sheldon also talks to Scott Snyder about the future storylines in both Batman and Swamp Thing, Simon talk to Amanda Connor and Len Wein about Before Watchmen and we ask Len Wein what it is like coming back to Watchmen after so many years. You know what just sit back and enjoy Did you Catch All That? for July and we will see you next month with a brand new episode!